Step back in time at St Nicholas Abbey and don’t miss the fascinating film! Barbados is world famous for its beaches but has so much more to offer the visitor. There are so many places to visit and we love the fact that, however well publicised, well-known attractions are far from commercial and organised in an informal and relaxed way – totally in tune with the island vibe! Between 1883 and 1937, a 24-mile-long narrow-gauge railway ran from Bridgetown to Belleplaine including a particularly scenic section along the rugged east coast past Bathsheba. The route had some very steep inclines, some very tight bends and involved 98 bridges. Over the years, the railway gradually deteriorated, and the line eventually closed to passengers in 1934 before the tracks were finally lifted in 1938. Now, Larry Warren and his family at St Nicholas Abbey, have launched a fabulous new tourist attraction for Barbados; a new railway line and the first train to run in Barbados for 81 years. 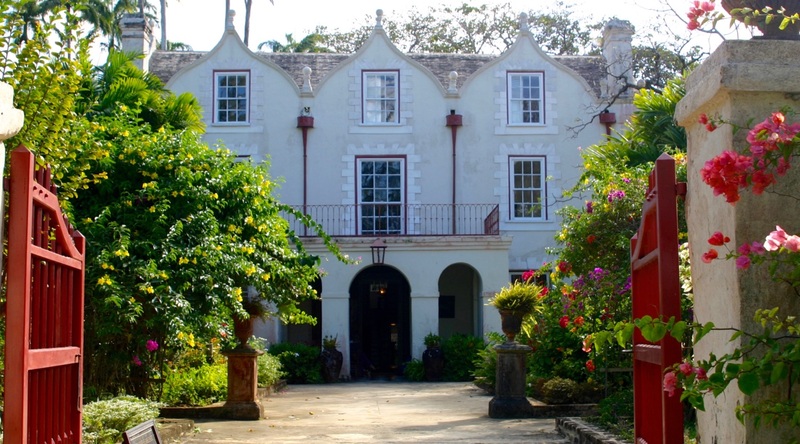 Hunte's Gardens, Barbados – the most enchanting place on Earth? Travelling to the middle of the island of Barbados doesn’t take long. Here, at Castle Grant, St. Joseph, you will find what Anthony Hunte describes as the most enchanting place on Earth, Hunte’s Gardens. Anthony’s boast may be stretching things a little but there’s no doubt that this place is indeed enchanting. Once a month in winter, St Nicolas Abbey host a special Moonlight Dinner and we were delighted to attend on Saturday (27th January 2018). The evening commenced with cocktails and canapés before we were seated at our candlelit table on the terrace. The excellent menu was created by Chef Scott Ames, who trained at a Michelin-starred restaurant in the UK and throughout the evening, we were treated to entertainment from Sarah Taylor with steel pan accompaniment. Where there’s fish, there’s fishing! Fishing is a way of life in Barbados, and the local fish caught are a staple of the Bajan diet. From the early hours of the morning, locals can be seen casting from the shore all along the West coast, and boats will be leaving Bridgetown for another day of deep-sea fishing. Among these boats are the private charters, which allow visitors to the island a taste of the action that the tropical waters provide. Many ‘attractions’ in Barbados are smaller than expected and the Barbados Wildlife Reserve is no exception. For ‘impressive’ substitute ‘charming’ and you start to get the picture but even if the rather odd collection of animals isn’t quite what you might have imagined, the reserve is no less engaging for visitors or all ages and is well worth a visit. There are so many places to visit on the beautiful island of Barbados but if you only allow yourself one or two trips out from your holiday villa then St. Nicholas Abbey should be one of them. With a rich and colourful history St. Nicholas Abbey remains, to this day, one of only three Jacobean houses left in the western hemisphere. Sometimes, even in Barbados, it can take a little time to fully unwind and feel rejuvenated and a visit to a local spa is sometimes called for! Fortunately, Barbados offers a great selection of desirable wellness facilities and my choice, the Spa at The Coral Reef Club, offers a wonderful experience from the minute you enter. The Animal Flower Cave, nestled at the very northern tip of the island, was something of a unique and memorable experience for us all, and one of the last pieces of our Barbados puzzle. Enjoying a dip in the perfectly still, transparent pool whilst looking out over the Atlantic was a highlight of our visit here. Barbados offers a choice of some of the best courses in the Caribbean and is increasingly regarded as one of the top Caribbean islands for a golf-based holiday. Whether you visit Barbados for golf-centred holiday or would just like to play the occasional round during your stay, the wonderful weather and attractive courses make this the perfect destination. There’s nothing better than messing about on the water and, for me, it doesn’t get much better than when that water is under a hot sun and when you’re sailing on the Caribbean Sea. But if you are visiting, how do you choose from the seemingly endless options available? You will find Very Vanita products for sale in most gift shops in Barbados. They are not difficult to miss as Vanita uses bright colours to depict local scenes with a very unique style. The Very Vanita gift range is a commercial offshoot of Vanita Comissiong’s work, which she displays together with the work of 15 other local artists, at her own On the Wall Gallery.